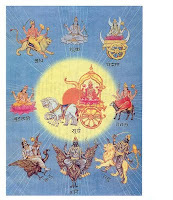 The Navagrahas are nine important dieties of the Hindu religious tradition. They are Surya, Chandra, Angaraka, Budha, Guru, Sukra, Sani, Rahu and Ketu. They stand for nine planets, the English equivalents of the first seven being, Sun, Moon, Mars, Mercury, Jupiter, Venus and Saturn. The last two, Rahu and Ketu are planet-like entities, unique to the Hindu tradition. The Navagraha Krithis are a set of 9 songs composed by Muthuswami Dikshitar, a great composer of Carnatic Music. These krithis are amongst the most esteemed krithis in carnatic music . In addition, they are great pieces of sanskrit literature that encapsulate almost all of vEdic astrology. Each song is a prayer to one of the nine Navagrahas ("planets" of Hindu Mythology). The last two (on Rahu and Ketu) were most likely composed by followers of Dikshitar, to complete the set of nine even though the signature used in the song is that of Dikshitar (guruguha). Here are various links to hear and enjoy the Navagraha Krithis on 9 planets composed by Muthuswamy Dikshitar.